The $1-billion MAG Eye project is an exclusive gated community of 4,000 apartments and 536 townhouses. MAG Property Development (MAG PD), the real estate development arm of MAG Group, has announced the launch of its flagship Dh4-billion ($1.08 billion) MAG Eye residential project in Dubai, UAE, for customers seeking exceptional investment opportunities. The project was launched at Cityscape Global, the leading real estate event which was held at the Dubai World Trade Centre (DWTC) from September 11 to 13. MAG Eye is one of the exclusive communities being developed in the heart of Mohammed bin Rashid City in Meydan Dubai, and is situated close to the Meydan Racecourse and many of the city’s most important landmarks including the Burj Khalifa, Dubai Mall and Downtown Dubai. Residents will also benefit from easy access to the city via the Al Khail and Mohammed bin Zayed roads, said the company. MAG Eye will offer a wide range of options including apartments and townhouse units. As well as featuring a calm and relaxing environment, all units will have a view of the city’s impressive skyline and private green spaces, while outdoor gardens embrace the project’s buildings to form an oasis of tranquillity. 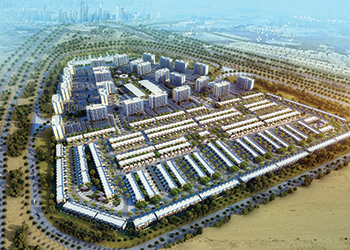 Talal Moafaq Al Gaddah, chief executive officer of MAG PD, comments: “At our MAG Eye project, we are presenting an exclusive definition of family housing by providing residents with the highest levels of privacy, comfort, and residential living at a strategic location in the heart of Dubai. “Our strategy for 2017 and 2018 is focused on delivering real estate projects that cater to every socio-economic need in the city. Aimed at developing what we call ‘value homes’, MAG of Value blends honest ROI (return on investment) with quality real estate, combining high quality developments, ideal planning and comprehensive services and facilities to deliver enhanced communities,” he adds. MAG Eye is an exclusive private gated community of 4,000 apartments and 536 townhouses that gives residents the option of studios and one-bedroom apartments, and three- and four-bedroom townhouses in Meydan District 7. Given its full privacy, all-day security, and wide range of green spaces, swimming pools, retail shops, gymnasiums, restaurants and cafés, the project will offer residents an ideal environment for relaxation and tranquillity.